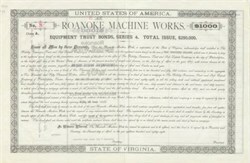 Unissued stock certificate from the Roanoke Machine Works dated 1888. This historic document has an ornate border around it. This item is over 128 years old. In 1883, two Norfolk Southern predecessor lines, the Norfolk and Western and the Shenandoah Valley Railroad, completed a facility in Roanoke, Va., with the capacity to handle equipment requirements for both. The facility, complete with a large foundry and machine shops, became Roanoke Machine Works. The first relatively small and lightweight locomotives produced by the facility in 1884 and 1885 cost $12,000 each. The shop was turned over to N&W in 1895. As the railroad grew in size, so did the facility and the services it provided. In 1957, a modern freight car building was added. Today, the complex occupies 84 acres and handles rebodying of freight cars and heavy repairs to all types of equipment, using a variety of computer controlled machinery and equipment.